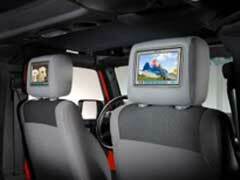 One of the best ways to keep passengers entertained is with headrest monitors. Many luxury vehicle brands like Cadillac have models equipped with car headrest monitors that can play DVDs. Drivers can also purchase the units and install them in any vehicle. To accomplish this, you’ll want to buy a top brand. Vizualogic headrest monitors are some of the best in the industry. They come with many cool features like a DVD and CD player, which is perfect for keeping others entertained during long trips. Another benefit is these are easy to install. What separates Vizualogic headrest monitors from the others was the company’s ability to make duplicate headrests that complied with all safety laws and could fit all vehicles. This means installation is a breeze as all you have to do is replace your headrest with those that contain the video monitor. This can save you a significant amount of money as this do it yourself option is much less expensive than having one installed by your car dealer. Once installed, you may run into some problems with your Vizualogic headrest monitors. Here are some tips for common problems. One of the most common issues is when no picture displays on your screen. When this happens, double check to make sure your red and yellow cables are plugged into the AV box. From there, double check to make sure you have the proper mode of video input from the menu. Another common problem with Vizualogic headrest monitors is when you receive no sound. First, you’ll want to double check to make sure the cables are plugged in to their appropriate position. Then, you’ll want to make sure each monitor is set up with the correct IR channel. The driver’s IR channel will be A, whereas the passenger’s will be B. From there you will want to make sure your FM transmitter is on and working. You can access this from the menu button under FM Source where you can test channels to ensure your unit is working properly. These are the most common problems you may come across with a headrest DVD player. Rest assured these errors are easy to fix. Ultimately, these units can provide passengers hours of entertainment. They are easy to install, fixing problems are simple and they are a great way to enjoy a long drive on the open road.